In The Wabi-sabi House, author Robyn Griggs Lawrence probes the essence of this Japanese philosophy-art: finding beauty in imperfection and nature’s cyclical march of growth, decay, and death. Wabi-sabi reveres authenticity above all: flea markets over big-box stores; aged items over new; handcrafted over churned out. Love and life are viewed in the cracks, crevices and blemishes of time, weather and use, a reminder that both our bodies and the material world are in the process of returning to whence they came—including a beach near you. Sure the majority of the 25 million tons that surged out to sea will sink to the bottom, and some will even be captured by the gargantuan plastic patch spinning aimlessly in the North Pacific Gyre, but plenty is still headed to North America’s west coast. And while also washing up on Alaska, Washington and Oregon, all of which have monies and plans in place to deal with it, the jurisdiction scheduled to absorb the majority of the debris, B.C.—with its labyrinthine 965 km-long coast (243,000 km total shoreline including islands)—still has no real plan in place, no monies set aside, and no idea what to do. “It’s so hypothetical,” former Environment Minister Terry Lake inexplicably stated a year after the earthquake/tsunami when the problem was anything but hypothetical. 10. Redneck Control. ATVers and 4-wheelers are attracted to landscapes like beaches that they can churn up with their vehicles. And in the same way flies are attracted to “post-digested food,” motorheads swarm to “post-technological items.” So if we leave the trash where it lies they will come, and, as shown on one CBC news report, their jacked-up trucks will get stuck in the sand and buried by the tide. 9. Public Housing. One group of people making hay of the bonanza are B.C.’s intrepid Gulf Islanders, who not only beachcomb between drumming circles and arranging dreamcatchers and crystals on their porches, but build homes, outhouses and all manner of inexplicable bricolage from the spoils. For those dreaming of adding an extra bedroom or sauna to their feral dwellings, a province-sized skein of flotsam is actually a floating RONA. And, if they can do it, why not governments? 8. Reality TV. Tsunami debris could seed several shows, from The New Beachcombers, a drama that follows a rag-tag group of coastal miscreants who chase wayward treasure in an assortment of aquatic, terrestrial and aerial vehicles, to Extreme Makeover: Hippie-home Edition, with certain types of debris guesting in episodes of Antique Road Show, Pawn Stars and Storage Wars. 7. Send it to the Kootenays. If you’ve driven the backroads of south-central B.C. you’re familiar with the adeptness of rural re-purposers in making fences and lawn ornaments from abandoned crap. Think windmills built from saki bottles, patio furniture cobbled from styrofoam and buoys, and shipping containers buried as underground grow-ops. Leftover junk could be spread in the Slocan Valley where it would be quickly subsumed into a deconstructionist landscape of sagging buildings and fields of rusting vehicles. 6. Public sculpture. Encourage famous artists to build pubic sculptures in urban centres and have the public bid on these art pieces. Proceeds would go to further clean-up efforts or tsunami relief to support those who lost the most. 5. Free Enterprise. 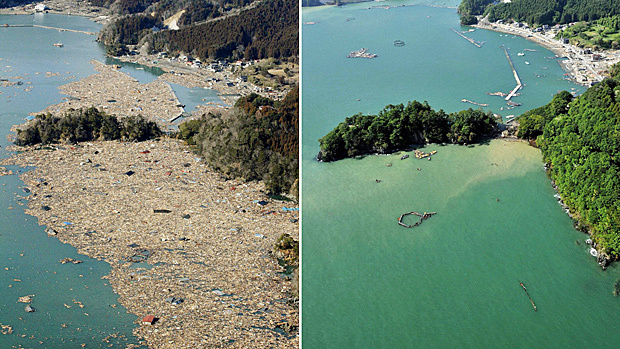 Air Burners Inc. can eliminate tsunami debris right on the coastline—no drying, no grinding, no landfill. In addition to their claim of the most cost-efficient and environmentally friendly disposal method, high-temp FireBox combustion also assures complete destruction of invasive species and microorganisms attached to the debris! 4. Build an Island. And put it somewhere conspicuously inconvenient and call it Clarkia as a reminder of a wait-and-see government that does nothing without sniffing the wind for political fallout and dodges any form of true leadership if it costs money or votes. 3. Send it to Alberta. They deserve it and can use it as landfill to raise riverside houses above the high-water mark or to remediate all the excavations left from tar-sands strip mining. Perhaps Enbridge could pay for it. 2. Generate Energy. Turn all the plastic debris back into oil. Seriously. 1. Dump it All at 24 Sussex Drive. Since no one wants to step up and pay, sending a token of our (lack of) esteem to Stephen Harper seems the surest way to raise public donations for a clean-up.